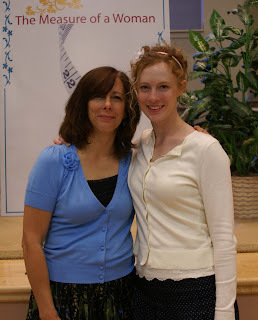 Today was our church's Mother's Day luncheon. It was exceptional, as always. The theme was "The measure of a woman." Our favors were measuring tapes (the kind for garments) and measuring spoons. 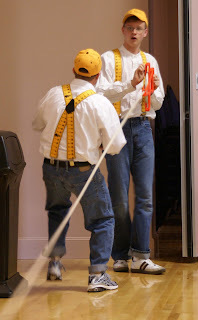 The gentlemen of the church, sporting measuring tape suspenders did all the waiting on us! 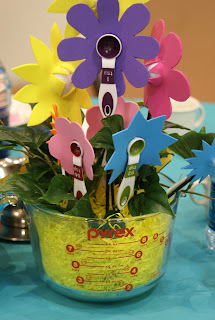 The centerpieces were adorable - large Pyrex dishes filled with foam flowers. The center of each flower was a measuring spoon. Here is the annual picture of the ladies of my family. This year, my mother-in-law was in warm and sunny Florida, so she did not attend. 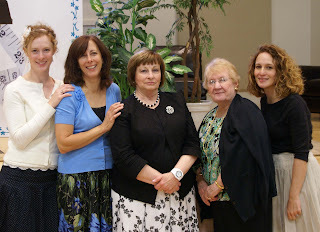 From left to right: Me, my mom, Gram, Grammy, and Auntie Paula. My aunt told us today that she's expecting her third child! My newest (and last) cousin will be due in December! Like my flower? It's my very first blog contest win! I won my friend Hillary's blog contest. I loooove this flower. The center of it is a vintage pin. Please visit her etsy shop to see her other creations! A capable, intelligent, and virtuous woman--who is he who can find her? She is far more precious than jewels and her value is far above rubies or pearls. thanks keri! you looked so cute. 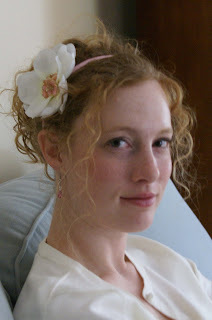 shannon, tara's cousin, left me a message about the headband too because she thought it looked so cute on you. i should give you business cards to hand out ;) ! You know what I noticed? All the women in your family look so young! Your Mom doesn't look old enough to be your Mom. You are so lucky, you will probably be the same. You will never look old! Genes, Kerri, genes! How fun! And what beautiful photos of you and your family!